Reprint of LEC #321, 29th Series, V. 6 in 1961. Front Binding – Salutations! Welcome back to our first post in the George Macy Imagery’s special Christmas book posting extravaganza! I apologize for the light updating this year, but I hope that having one post per day for over a week will even things out a little bit. Anyway, our first post in this series is Rights of Man, done by the early American (ex-Brit) Thomas Paine in the heydays of the American Revolution and subsequent Constitutional Congress. 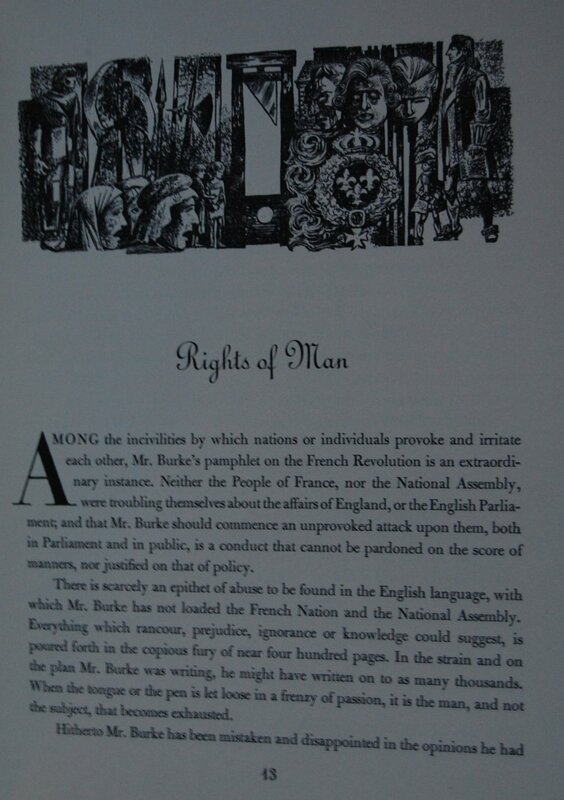 Written originally as a rebuttal to the work of Edward Burke, Rights of Man continues to stand as one of the more extraordinary political documents in American history, crystallizing and championing the concepts of democracy and social welfare. However, this particular text was written in England post-Revolution, and was not, shall we say, considered a popular work in the eyes of the British government. Paine escaped capture courtesy of another name familiar to readers of this blog: William Blake. Blake warned Paine prior to the execution of Paine’s arrest attempt, and Paine slipped across the seas to France. A grand history of Paine’s exploits can be found in the Sandglass (which I will add later on). This was Paine’s first and only LEC/Heritage offering, but it’s a really nice one — perhaps one of my favorites of Helen Macy’s tenure of the Club. The illustrator of our edition is not new to this blog; it’s one of the Company’s most frequent contributors, the impeccable Lynd Ward (We’ll see him tomorrow, too). Ward’s LEC bibliography is here. Ward is shuffled to the end of the Sandglass — curious choice, that, but he has certainly had his fair share of text in these letters prior to Rights of Man, so I don’t imagine it to be a slight. He went with drawings for this particular book, which retain his compelling style (unlike some artists who shift from their prominent medium to another, like Eichenberg for instance). The Heritage relied on red and black inks to convey his intent; I’ll let you know if the LEC printings were more dynamic. Design Notes – Roderick Stinehour handled the design of this book — he also handled the designs for The Song of Roland. The text comes from the 1894 collection of Paine’s work compiled by Moncure D. Conway, and was printed in a dynamic Bulmer font in 14 point on an 18 point base. Typo Upright serves as the chapter/section/running headings font. Mead Paper Company supplied specially-made gray paper for this edition. 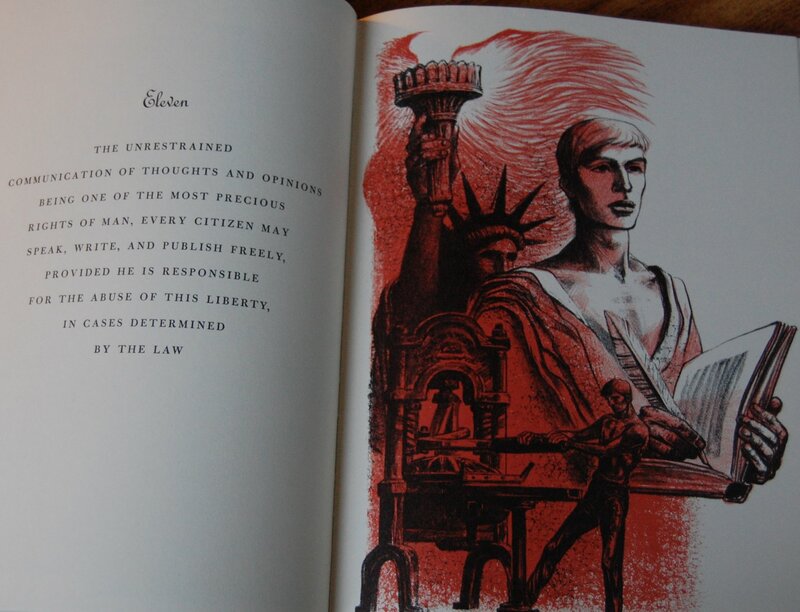 George C. Miller & Son tackled the reprinting of Ward’s illustrations, while Reehl Printing Company took on the text. Russell-Rutter bound the text, and the cloth is a full linen emblazoned with, as the Sandglass puts it, “the red flames of revolution”. Title Page – Author Howard Fast supplies an introduction, and Ward serves up a lovely portrait of Paine. Page 13 – Ward did several chapter opening sketches on top of full page illustrations. Page 98-99 – Each of Paine’s tenets have a full page drawing. Lovely work. Personal History – I am not 100% sure where I found this book. I think I got it from a Mariposa Library sale, but I do not recall. I’ve had it for quite some time now, and when you have a collection that has been in flux as much as mine, it’s difficult to remember every origin for every book. I do look forward to reading it, though. You are currently reading Heritage Press – Rights of Man by Thomas Paine (1961) at The George Macy Imagery.